This sequence then repeats the loop that began at 4. These sequences are always eventually periodic. Although these sequences are simple to understand and calculate, there are several interesting ways of describing them. For example, you can think of the elements of T_b,d as a commutative monoid, with multiplication defined as a*b = (a*b)mod 10^d. They form a monoid since 1 is always a member, and you can show that T_b,d is closed under the * operation. It turns out that for some values of b, and d, T_b,d is a group. You can also think of this set as a finite state machine or graph, where each element is a node and the transition from one node to the next is defined by the operation *b mod 10^d. 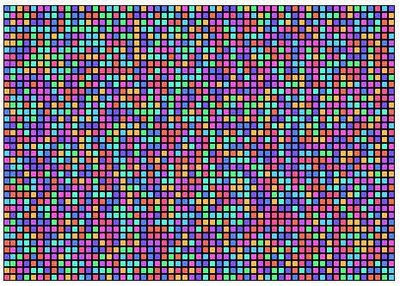 This provides a nice way of displaying the sequences. 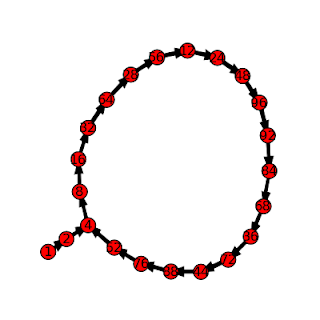 The pictures in this post were created by writing a short program to calculate the sequences, and then formatting the output to draw a di-graph in SAGE. The graph at the top of the post is for b=8, d=1, while the graph below is for b=2, d=2. The graph at the bottom of the page is for b=7, d=1. The third diagonal column in Pascal's Triangle (r = 2 in the usual way of labeling and numbering) consists of the triangular numbers (1, 3, 6, 10, ...) - numbers that can be arranged in 2-dimensional triangular patterns. 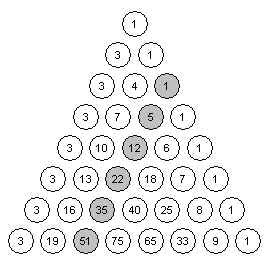 The fourth column of Pascal's triangle gives us triangular-based pyramidal numbers (1, 4, 10, 20, ...), built by stacking the triangular numbers. The columns further out give "higher dimensional" triangular numbers that arise from stacking the triangular numbers from the previous dimension. In the above equation p^d_(k,n) is the nth k-polygonal number of dimension d. Triangular numbers are the 3-polygonal numbers of dimension 2, square numbers are the 4-polygonal numbers of dimension 2, "square based pyramidal numbers" would be denoted as p^3_(4,n). Which looks very much like the Pascal Identity C(n,r) = C(n-1,r-1) + C(n-1,r), except for some translation of the variables. To be precise, if we consider the case where k=3 and use r = d and n' = n+d-1 we can translate the triangular numbers into the appropriate positions in Pascal's Triangle. Along with the definitions for the end columns, the Pascal Identity allows us to generate the whole triangle. This suggests the following strategy for calculating the higher k-Polygonal numbers: create a modified Pascal's Triangle whose first column is equal to k-2 (instead of 1), and whose last column is equal to 1 (as usual). This modified Pascal's Triangle is generated using these initial values and the usual Pascal Identity. Here is an example with k=5, which sets the first column values equal to 3 (except for the top value, which we keep as 1) and yields the pentagonal numbers (column 3) and the higher pentagonal numbers. This formula illustrates how polygonal numbers are built out of triangular numbers. It says that the nth d-dimensional k-polygonal number is equal to the nth d-dimensional triangular number, plus (k-3) copies of the n-1 d-dimensional triangular number. This is a little easier to understand when you forget about the higher-dimensions and look at the regular 2-dimensional polygonal numbers, as described in another post. Although creating origami sonobe units is likely to be considered by most to be an essential part of making sonobe polyhedra, a cut-out version of the sonobe module can be used to help beginners learn how to weave the units together. The unit pictured here can be reproduced multiple times in a document (a PowerPoint slide works well, since you don't have to worry about margins), and printed onto card stock. Printing onto card stock gives a solid unit to work with, while regular paper will likely be too flimsy. After printing, cut out each unit and cut slits into them along the bold horizontal lines (a utility blade or exacto-knife works well). Depending on whether you want to hide the printing or not, you can mountain-fold the diagonal line and vally-fold the dotted vertical lines, or vice-versa (all modules should be folded the same). You will need 6 units for a cube, 12 for an "augmented octahedron", and 30 for an augmented icosahedron. Models can also be assembled from 3 units (a triangular di-pyramid) 9 units (two fused cubes), and other combinations. The main idea in creating this module was to create a set of reusable units that could be used in professional development workshops for teachers learning modular origami for the first time. After seeing how the units hold together, the next step is to learn how to fold the units from paper. Instructions for assembling the units are available here, among other places. To construct smaller modules, simply connect less than 5 units around. A 4 unit base will form the pattern for the augmented octahedron (which will take a total of 12 units). A 3 unit base will form the pattern for the cube (which will take a total of 6 units). 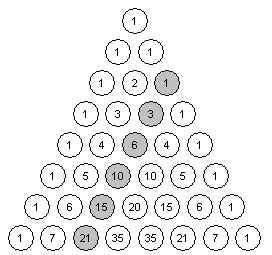 The diagram above (known as the tetractys) shows the first four triangular numbers (1, 3, 6, 10, ...). Although there is a simple formula for calculating these numbers directly, t(n) = 1/2(n(n+1)), constructing them by these layered-triangle diagrams helps to show their geometric and recursive properties. More generally, polygonal numbers arise from counting arrangements of dots in regular polygonal patterns. Larger polygons are built from smaller ones of the same type by adding additional layers of dots, called gnomons. Beginning with a single dot, k-sided polygons are built by adding gnomons consisting of k-2 segments, with each segment of the gnomon having one more dot than the segments of the previous layer. In this way, the nth gnomon consists of segments each n dots long, but with k-3 dots shared by adjoining segments (the corners). This post describes how you can draw figures that illustrate the polygonal numbers and explore the polygonal numbers in general (triangular, square, pentagonal, hexagonal, etc.) using either TinkerPlots or Fathom. Both TinkerPlots and Fathom work well, but TinkerPlots creates nicer pictures, and allows for captions directly on the graph. Without describing the details of how you create Fathom or TinkerPlot documents, here are the attributes that you will want to define in order to draw diagrams like the ones shown. n The number itself. 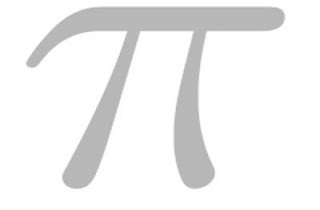 This is a natural number beginning at 1 and continuing through the number of cases. gnomon This states which "layer" or gnomon the number belongs in. It is calculated based on a number of other attributes. g_index This is the position of the number within the gnonom - it ranges from 1 up until the next k-polygonal number is hit. s_index Each gonom is broken up into sections or sides - what is the position within the side? 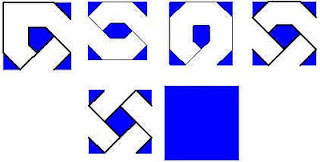 Each side is of length equal to the gonom number. 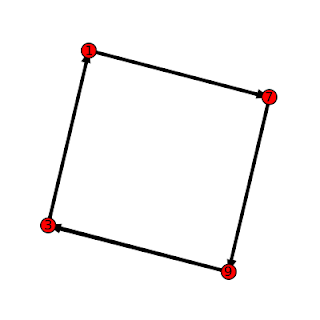 The first gonom has sides of length 1, the second has length 2, etc. corner This keeps track of whether or not the number is a "corner" or not. This is based primarily on the s_index attribute. c_index This keeps track of how many corners we have so far. There are only k-1 corners in a gnomon (the first number n=1 is the remaining corner). So, when we hit the last corner, we know we are at a polygonal number. k_poly Records whether or not the number n is k-polygonal. It does this by checking to see if it is the last corner of a gnonom. The attributes listed above are required for finding the position of each number within the figure; th following attributes are used in actually drawing the figures. angle The base corner angle for the polygon is determined by k. This is the external angle for each corner. current_angle We have to add to the base angle at each corner as we turn at each corner. This attribute is used to keep track of the total current angle. 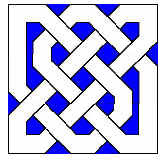 dx This is the x-component of the unit direction vector that we are travelling in. Each new dot moves one dx over in the x-direction. It is given by the cosine of the current angle. 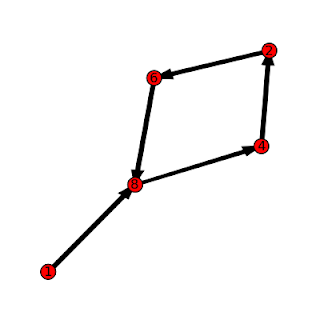 dy This is the y-component of the unit direction vector that we are travelling in. Each new dot moves one dy over in the y-direction. It is given by the sine of the current angle. prev_g_1_x This is the x-coordinate of the first dot in the previous gonom layer. We need to know this because it will be the starting point for the next layer - each layer starts back at the "beginning" of the figure. prev_g_1_y This is the y- coordinate of the first dot in the previous gonom layer. x This is the x-coordinate of the current dot, calculated either from the previous dot or from the first dot in the previous layer. y This is the y-coordinate of the current dot, calculated either from the previous dot or from the first dot in the previous layer. Below are the formulas for each attribute, written in "ascii" math. They are presented without a full explanation, in the hopes that if you try to implement this you will think about and explore each using the formulas and the descriptions above as a guide. Alternate methods for drawing the diagrams are possible, and you might find other formulas that achieve the same goals. Note that there are nested if() statements in several formulas. To actually draw the diagrams, create a new plot with the x and y attributes as the horizontal and vertical axis, respectively. Add cases to the collection to populate the diagram. Optionally you can show connecting lines, and (in TinkerPlots) add a legend using the caption attribute.